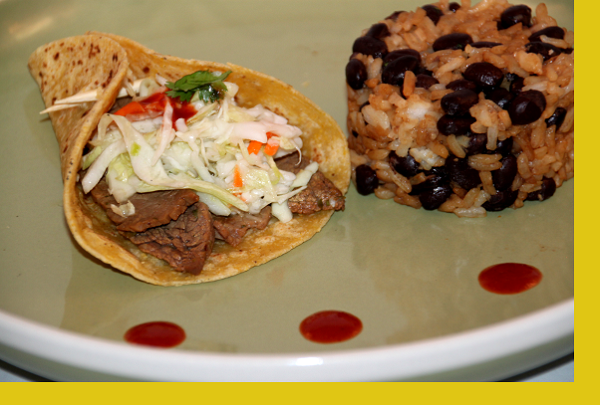 Asian-Mexican fusion is one of the hottest trends and these steak tacos won't disappoint. Thinly sliced flank steak tossed in a special Asian marinade that helps to keep the meat tender while giving it a sweet finish are topped with an Asian inspired slaw. It's not complete without rice and beans ... Asian inspired of course. Pour the meat into the marinade bag. Keep cool in the refrigerator for a least 30 minutes but not more than 12 hours prior to cooking. Discard the marinade and pat the meat dry. Heat a non-stick pan on high heat. Sear the meat in batches 1 minute per side until cooked through. 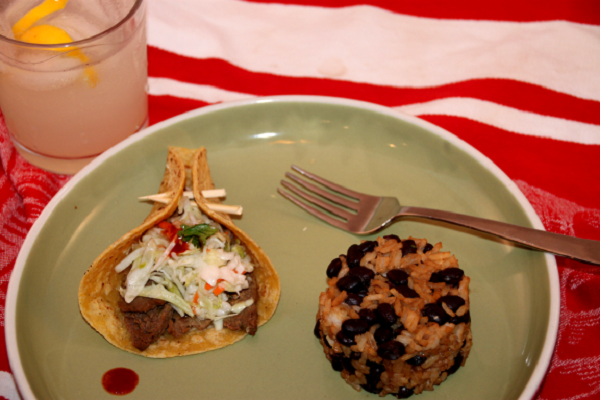 Serve with tortillas, rice & beans and slaw. Good fusion taco! Flavorful and light. 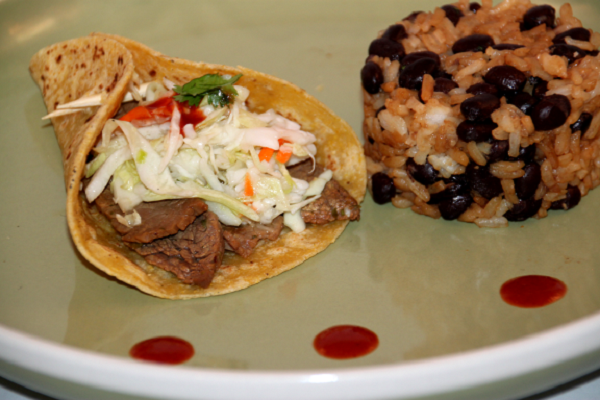 The tacos were really good, the black rice and beans are delicious. This is our favorite meal from Maria's. The marinade is awesome and the meat tastes wonderful. The rice is delicious and I use any leftovers in breakfast tacos the next day. Easy to prepare and so delicious. Flavorful, delicous, easy to make! I loved the slaw - this was really good! Maybe more tortilla next time? Yum!! Very easy to prepare and generous portions. The meat had a good flavor, but the star of this dish was actually the rice. I don't like beans, but the rice was so delicious that I didn't even care that it had beans in it! I'm not giving it 5 stars because I hated the slaw. The dressing was very vinegary which I found unpleasant. I'll definitely order this again, but I'll make my own slaw next time.